AMD to launch two unlocked APUs on December 26th? 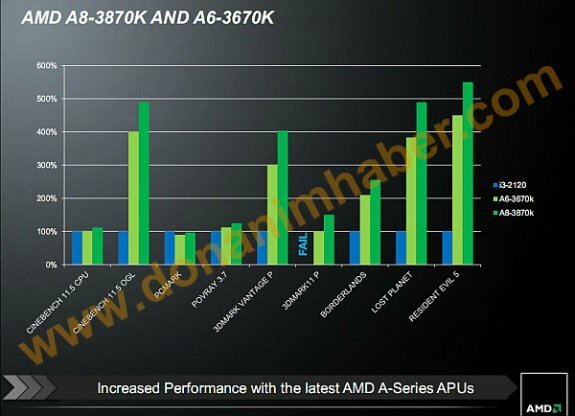 TPU reports AMD is expected to introduce the A8-3870K and A6-3670K Black Edition "Llano" APUs on December 26th. These two FM1 chips will offer an unlocked base clock multiplier, and pricing of $135 and $115, respectively. These chips pack four x86-64 cores based on the "Stars" K10.5 architecture with 1 MB dedicated L2 cache per core, dual-channel DDR3-1866 MHz integrated memory controller, PCI-Express 2.0 root complex, and a "discrete-class" graphics processor that packs 400 VLIW5 stream processors, DirectX 11 support, and the ability to pair with similarly specc'd discrete GPUs. The A8-3870K Black Edition features x86 core clock speed of 3.00 GHz, and Radeon HD 6550D graphics that features all 400 of those stream processors, with 600 MHz GPU clock speed. The A6-3670K Black Edition, on the other hand, has its x86 component clocked at 2.70 GHz, it features Radeon HD 6530D graphics that has 320 out of the 400 stream processors enabled, and a GPU clock of 433 MHz.